2016 marks the 80th Anniversary of the brief reign of King Edward VIII. The events surrounding his reign and subsequent abdication - are among the most remarkable and controversial in modern British history. After King George V died in 1936, his son King Edward VIII acceded to the throne, however, Edward was romantically involved with American divorcee Wallis Simpson. This threatened to bring scandal to the monarchy and led to his decision to voluntarily abdicate. He became the only monarch in our history to do so - handing his throne to his younger brother King George VI, within twelve months of his accession. The consequence was that no British coins were struck featuring the effigy of King Edward VIII. A historical anomaly put right today! In the 80th anniversary year of Edward's abdication, the King Edward VIII Pattern Maundy Set puts right this historical anomaly! 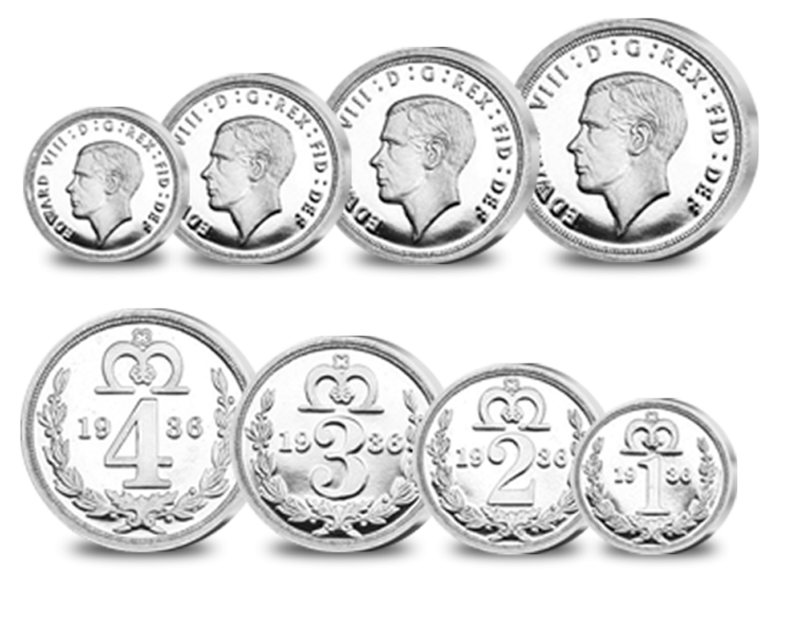 Using the portrait that Edward himself had approved for use on British coinage, this set of four sterling silver patterns recreates the Maundy coins that never were - each following the precise measurements, design and silver content that have been part of Royal Maundy tradition for so many years. Due to the technical complexities of creating Pattern pieces of such quality, just 499 of these set have been released. Follow the established sizing of Maundy 11mm for the penny, 13mm for the twopence, 16mm for the threepence, and 18mm for the fourpence.